It's Royal St. Claire Day! I declared October 20, 2017 Royal St. Claire day because his story is out today! 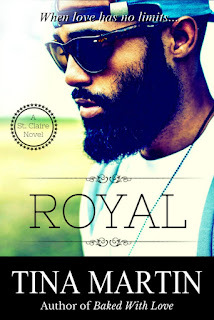 If you're a fan of The Boardwalk Bakery Series (you know, the Baked With Love books about quirky Gianna and debonair Ramsey St Claire) then you don't want to miss Royal (A St. Claire Novel). Royal has an attachment to Gemma as you'll see right out of the gate. But Gemma, poor Gemma, has no idea that he's feeling her. Everybody else can see it except for her. Royal is just a friend, she thinks, and he is a friend, but it's hard to be just friends with a woman you're in love with. And Gemma is, well, Gemma. In some ways, she's quirky like her sister, but she too has a lot of issues that threatens her sanity. (Like Geraldine. Ugh. Remember Geraldine? She's back, too.) But she'll find out when a St. Claire has her back, there's nothing she can't do or handle. Get your Kindle copy of Royal today at Amazon. *Available in paperback. Also coming to other retailers. For a listing, go here.